I suppose there’s always a trade-off when you’re trying to write something between being a complete hermit and staying in solitary confinement to get something down on paper and also going out and interacting in order to collect experiences to write about. It’s often surprised me on some of the creative writing courses that I’ve done that a lot of people tend to end up on the extreme side of staying in and writing. I’m always surprised that they can write about so much without experiencing it themselves. I’ve had the opposite problem in the last few days — very little time to spend on the writing as I’ve been doing so much. Last night I was out in Marlow and High Wycombe — experiencing market town circuit drinking bars at their most prosaic in Wetherspoon’s in High Wycombe at 10pm. 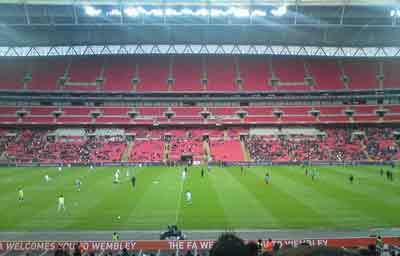 Then it was back on the train through Wycombe this morning to go to Wembley to watch England Under 21s play Portugal with my son’s football club (the tickets were very cheap and we had a superb position on the centre line just below the television cameras — see the photo). And this weekend we have a momentous thirteenth birthday happening in the house — and I might have to go and watch the 2.5 hour long ‘2012’ film as part of it. And I need to plant a boxful of bulbs (mainly tulips) that should really have gone in at half term — and I need to go for a long run to work off all the crap (doughnuts, sweets, crisps and so on that I ate at Wembley). And I need to write some articles about walks I’ve done locally. AndÂ I have a bunch of interesting programmes waiting to be watched on the hard drive. I suppose I ought to be happy if I just get the synopses rewritten as opposed to anything else.